The path to the light travels straight through the darkness. The last time we'd kissed, my powers had been dangerously out of control. He'd almost been killed. I couldn't let myself lose control again. As I passed the library, I saw something moving from the corner of my eye. Something dark and large and fast. I stopped and peeked inside. Of course there was nothing. no one was in the tiny reading room, alive or dead. An enticing sequel to a fabulous and exciting series that instantly became one of my favourites. Robin Bridges does not disappoint. Once again she has crafted a mesmerizing, imaginative and entirely unique story that - and I kid you not - is even better that the explosive mix she enthralled us with in the first volume. The Unfailing Light picks up more or less where the The Gathering Storm left off. After the battle with the lich tsar Konstantin, Katiya enjoyed a few weeks of peace. All she really wants now is to forget about the darkness inside her and move away to Zurich to pursue her medical career. Just when she's about to leave Russia, she discovers that the lich tsar Konstantin has not been destroyed after all. There's a traitor among the wizard of the Order, someone supporting Konstantin and plotting against the tsar. Katiya's life is once again in great danger. Ordered to remain in St. Petersburg, Katiya goes back to her old school at Smolny. But will she be truly safe there? What she doesn't yet know is that the protective spell cast on the school by the empress unleashed an old vengeful spirit and, while no threat from the outside can get in to harm her, she herself is unable to leave the school to escape the murderous ghost. WOW! What a wild ride that was! Robin Bridges does a fantastic job interweaving Russian history and folklore with paranormal elements. She makes the already fascinating Imperial Russia even more sparkly, glamorous, sinister and dangerous! I loved reading about all the new dangers and challenges that our characters had to face. In addition to the already familiar threats - the lich tsar and the evil plottings of the Dark Court - Katiya also has to confront a vengeful ghost that is wreaking havoc at Smolny. Not to mention the darkness within herself that she struggles with. 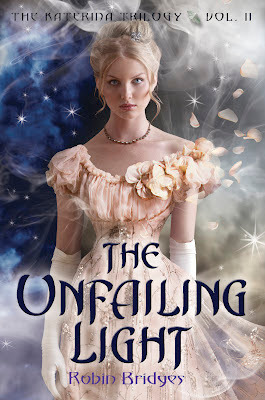 I felt that the plot of The Unfailing Light - while still undeniably eventful and rich in details - was definitely more organized, easier to follow and - most importantly - deeper and more meaningful. The already large cast of characters and paranormal creatures from The Gathering Storm gets even larger with the addition of some great new heroes and beings straight from Russian fairy tales. We still get to meet all (or almost all) of our favourite protagonists (including those that we love to hate), but we're also introduced to new (and equally fascinating) ones. At the same time, we get to know our main characters a little bit better, learn more about their pasts, hopes for the future, and personalities. I enjoyed observing the developing relationship between Katiya and Goergi, but I also had a lot of fun observing the dynamics between Katiya and Danilo. I must say I liked Danilo much better in this book, he wasn't as cold and controlling as he was in The Gathering Storm, and I definitely warmed up to him. Plus, all the telepathic conversations these two had (thanks to their blood connection) were simply hilarious. Their often lough-out-loud funny back-and-forth made this book so much more entertaining to read! Most importantly, though, Katiya became a much better central character. She was stronger, wittier, more self-confident and assertive. She still internalized most of her struggles, but she also began to understand that working alone is not always the best option. I really appreciated the character growth in her and I can now say that she became a heroine worth rooting for! Overall, The Unfailing Light is a fabulous follow-up to The Gathering Storm. A sequel that is even more exciting, more glamorous and more visually breathtaking than the first book! It has everything I loved about the first book - sumptuous balls, an insightful look at the political dynamics of Imperial Russia, heart-pounding romance, rich and fascinating Eastern-European folklore, and a fantastic cast of characters that you'll grow attached to even more! On top of all that, Bridges writing style is even more eloquent, seductive, and lyrical, and the interesting plot line remains complex without being confusing and overwhelming. I can honestly say that I loved this book even more than I loved The Gathering Storm. If you like Russian folklore, culture and history, this is a series you ought to have on your bookshelf! Robin Bridges is no doubt a very talented author and easily one of my favourites! I can't wait to read the next book in The Katerina Trilogy and find out what happens next! I'm not into historical fiction so I haven't read any. The series seems great, having 5 stars. I'll definitely give this series a try. Thanks for the review! Great review! This trilogy has really caught my interest. It sounds so different from everything else I've read. It's definitely on my wishlist!! That's a great review. So many second books aren't as good as the first. I'm definitely looking forward to reading this. Thanks for the review. From your review, I now have a much better idea of what The Unfailing Light is all about. It sounds like you enjoyed it even more than The Gathering Storm, so I'm looking forward to reading it. I've not read either of Robin Bridges' books, but judging from your 5 stars, I know I need to do it soon. I love a good world building in my books, and can't wait to be drawn into this! Thank you so much for the review! I haven't read the first book yet, but this series sounds amazing, and I love hearing that the sequel is amazing and not a let-down compared to the first. Thanks for the review!! looks like a great book. thanks for the review. Pretty cover! :) Thanks for review! I'm so glad you loved this one! I was little disappointed by it. I found it slow and not as exciting as the first book. I'm definitely still eager to read the final book though! I'm glad to see that this one is even better than the first one! A lot of times the sequel kind of falls short... Also, this cover is even more gorgeous than the first one! I haven't had a chance to read this one, but I'm even more excited to now! I am so excited to read this book. I can't believe I put off doing it for so long! Your review makes me want to put down what I'm currently reading and pick it up ASAP. I enjoyed your review and I love the quotes you chose. I haven't had a chance to start this series yet, but I'm really looking forward to it. I think all of the covers for the series are beautiful. Love the dress on The Unfailing Light. Great review! This series sounds really interesting and different from anything else out there right now. Russian history and mythology sounds really cool! I really need to read this series soon! Apparently I didn't comment on this one either. WTH? Did I miss these posts somehow. I thought I read them. Anyways. I love it when you love the second book in the series too since so often they can just be filler book. I wasn't really very interested in this series before since I tended to stay away from historical books, but I have found that I actually enjoy them. Lol!! Awesome review as always hon!! This sounds like a great follow-up to The Gathering Storm. I'm impressed that the author managed to balance a large cast and *still* create some character development in the more important ones. Sounds like a wonderful series!